LOLLYWOOD: After Iman Ali’s trendsetting shendi, our social media timelines have been flooded once again with another extravagant wedding. 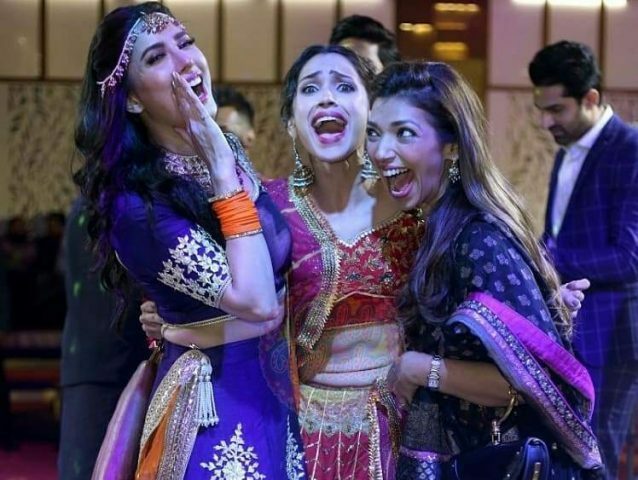 It seems like wedding season in Pakistan is not over just yet as actress Mehwish celebrated the shendi ceremony of her brother Danish Hayat and model Faiza Ashfaq on February 27. The Punjab Nahi Jaungi actress set the floor on fire with her move after move accompanied by many other stars from the industry. Where bride and groom choose to don outfits from Sabyasachi’s last season collection, Mehwish stunned in a Sanober Azfar dazzling royal blue and orange lehenga choli, with a matta patti and a choker to complete the look. The bride Faiza was dressed in the same lehenga choli worn by Bollywood actor Anushka Sharma on her mehendi lagai ceremony two years ago. The ceremony was attended by many celebrities including actors Bahroz Sabzwari, Javed Sheikh, Zara Noor Abbas, Asad Siddiqui, Faryal Mehmood, Azfar Rehman, Sadaf Kanwal, Imran Ashraf, Amna Ilyas, Ali Kazmi, Sharmila Faruqui with her husband, Frieha Altaf and Fouzia Aman. The couple also had a pre-shendi dinner held at Ambrosia earlier this week.